TriMet’s Making Transit Better efforts to rejuvenate the MAX system continue in 2018 with our next major MAX improvement project in the Providence Park area. 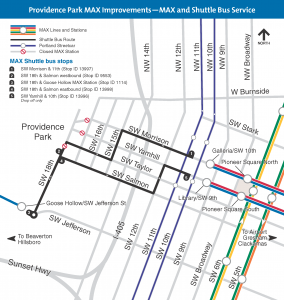 While the Providence Park MAX Improvements will not have the same impact on MAX riders as previous years’ work, it will disrupt MAX Blue and Red lines from Sunday, May 6 through May 11, and reduce service on the Orange Line during commuting hours. The project, estimated at about $1 million, will increase the reliability of MAX service through Downtown Portland, give us more options to keep trains moving if a disruption occurs and make for a smoother ride for our customers. It will also create a smoother surface for pedestrians, cyclists and auto drivers. Crews will replace switches and sections of rail on SW 18th Avenue that were installed in the mid-1990s as part of the Westside Light Rail Project. We’ll be improving the track bed and the drainage for switch machines, while upgrading the materials used next to the rails to reduce spalling and potholes from forming. While MAX service is shut down through the area, crews will move several poles that hold up the overhead power wire at the Providence Park eastbound platform as well as an equipment cabinet. This is needed for the Press Blocks development. TriMet staff will also complete heavy duty track maintenance and station cleaning in the area. The Providence Park MAX Improvements already have led to a change that’s increasing the on-time performance and resiliency of the MAX system. Signal system improvements near the east end of the Robertson Tunnel now allow trains to run more efficiently leading up to and through the tunnel. The signal system upgrades were needed for operations at Goose Hollow during the planned May disruption, to provide as much service as possible and keep trains on schedule during the project. From Sunday, May 6 through Friday, May 11, MAX Blue and Red lines will be disrupted with shuttle buses running between Goose Hollow/SW Jefferson St Station and Library/SW 9th Ave and Galleria/SW 10th Ave stations. Only MAX Blue Line trains will run west of Portland City Center, between Hillsboro and the Goose Hollow/SW Jefferson St Station. For riders traveling east to Gresham or Portland International Airport through Portland City Center, board any train and exit at Goose Hollow MAX Station. Board shuttle bus one block east at SW 18th and Goose Hollow and exit at SW Yamhill and 10th to transfer to Blue and Red Line trains at the Library/SW 9th Ave Station. For riders traveling west to Beaverton or Hillsboro through Portland City Center, exit trains at Galleria/SW 10th Ave Station and board a shuttle bus at SW Morrison & 11th Ave. Exit at SW18th & Goose Hollow and board any train at Goose Hollow/SW Jefferson St MAX Station. Westbound riders at the Goose Hollow Station will use a temporary wooden platform, installed over the westbound tracks, to board trains. MAX Blue and Orange lines will have less frequency during the six-day project and riders should plan an extra 15-30 minutes for their trips. MAX Blue Line, which will be the only line serving the west side during the project, will run about every 10-12 minutes between Hillsboro and Portland City Center during commuting hours, and about every 15 minutes during other times. MAX Blue Line between Portland City Center and Gresham will have fewer trains running during commuting hours. MAX Orange Line will have fewer trains running between commuting hours. We encourage riders traveling on the west side of Portland City Center to consider altering their trips to avoid commuting hours or take regular TriMet bus service, carpool, work from home or use alternate transportation. Get more information at trimet.org/providencepark. Riders can call TriMet’s Rider Support team at 503-238-RIDE to get personal trip planning help seven days a week between 7:30 a.m. and 5:30 p.m. They also can ask questions about alternative trips on Twitter via @trimethelp seven days a week between 7:30 a.m. and 5:30 p.m.
During past major MAX improvement projects, riders may have chosen not to buy a monthly paper pass in case they opted for a different way to commute. With the Hop Fastpass™ card, there’s no need to think about that at all. With Hop, you only pay for the rides you take. If you do end up taking as many trips that add up to the cost of a month pass, the rest of the rides taken with Hop that month are free. Same on a daily basis – use the Hop card for two trip more than 2½ hours apart in one day and earn a day pass. To learn more about saving money with Hop and the other benefits it brings, go to myhopcard.com. We at TriMet continuously work to improve the reliability and resiliency of our bus and rail systems while growing our service and enhancing the customer experience. In 2016 and 2017, we completed major track, rail and switch improvements on SW Morrison and Yamhill streets at SW 11th Avenue, along 1st Avenue in Portland City Center and at the Rose Quarter Transit Center, a project that improved the signal system and adjusted the track alignment going into the transit center as well. TriMet staff work diligently to complete as many improvements to the MAX system as we can during these major track projects while minimizing – as much as possible – the inconvenience to riders. We appreciate your patience and understanding as we work to make transit better.